6061 aluminum plate sheet can be processed into varieties of tempers, such as O, T4, T6, T651, etc. Among them, T4 and T6 are the most common ones for their good machanicability and weldability. Therefore, 6061 aluminum plate is generally used industrial structure frame, which requires high anti-correction, such as truck, construction, ships, trolley bus, railway transit, etc. Mg and Si are added to 6061 aluminum sheet, thus, it has middle strength and good resistance to correction. 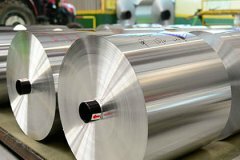 Cu and Zn can also improve the strength of aluminum alloy. Besides, 6061 aluminum sheet plate probably the most commonly available, heat treatable aluminum alloy. 6061 aluminum sheet can be easily cold worked and formed in the annealed condition. Stamping, bending, spinning, deep drawing are all readily accomplished using standard methods. By adding copper, 6061 aluminum sheet has 40% electrical conductivity.